These skills have been applicable throughout the era of modern science. Chemistry is an information intensive field, typified in the magnitude, diversity, breadth, depth and detail of its documentation. The good news is there is a lot of information to ‘mine’ for research questions, and you will be learning various methods throughout the course. The challenge is staying organized in the deluge. Meeting this challenge is known as information literacy, breaking down research problems into discrete steps of critical inquiry. There are many information steps and tools involved in rigorous chemistry research! Guides to getting started, specific resources and advanced searching techniques can be very helpful.1 More are always needed, especially for local institution resources and services. In this section you will be asked to create a guide for your peers based on your own 1-5 step research process. Please note: most of these databases index the citation and abstracts of articles; fulltext of the articles are often linked with the database records through your institutional citation link resolver to journals your institution have access to. Occasionally, you may discover articles that your institution does not have access to online. You can consult with your institution’s library for access to the print source or through interlibrary loan service. Most of the databases, especially the subscription based ones, provide useful tools to refine your search. You may use the advanced search features and/or filter options in these databases to optimize your search strategy. Here are a few useful tips in general for searching databases in Chemistry. Databases such as SciFinder, Reaxys, PubChem, and ChemSpider listed in the above table index physical properties, spectra, and bioactivities and can be searched through chemical substances. When you locate the interested substance in these databases, you can navigate to the particular physical property data or spectra under various sections in the substance record. Please note: you may need to go to the linked primary literature from the database to obtain the actual spectra or the conditions of how a piece of physical property was measured. There is another type of databases which function as repositories of spectra, such as the Spectral Database for Organic Compounds, SDBS. In SDBS, you can download the spectral data directly. Handbook examples include CRC Handbook of Chemistry and Physics and ASM Handbooks. You may either browse the handbook by property categories or use the index to search for a specific substance. Online versions for many of these handbooks are available and will allow you to search for property data and spectra with keyword searching. Some handbooks available through the Knovel platform may even allow you to download and interact with individual tables and graphs containing substance property data. When you use physical properties and spectra discovered from literature in your own writing or presentation, the condition of how the data were measured are often important to include; because different conditions can generate very different data from the same substance. Without the original context, the audience of your writings will not be able to interpret the data you cited and evaluate your research based on the data. You can always consult publications and learning materials from chemical information professionals for advanced search skills like those can be found in XCITR.1 It takes practice and patience to become a power searcher in the chemical information world. In reality, you may need to balance the comprehensiveness of results and the time spent to seek for them. Please never hesitate to consult with your librarians and experienced researchers around you for suggestions and tips. Further more, with what you will learn in this class, you will be able to see the chemical information world from an insider point of view. For example, in module 5 of this class: Comparing and Searching Chemical Entities, you will learn more about how databases like PubChem and ChemSpider are organized and updated in order to understand the advanced methods to retrieve chemical information from them. Nowadays, search engines like Google and Google Scholar and collaborative references online like Wikipedia can often provide quick and easy access to chemical data and literature online. They can be used to get started with a topic as long as you pay attention to the true source of the data and information discovered and evaluate the sources carefully as described in the next section. For comprehensive research on a topic and finding credible sources, these quick tools are usually not sufficient. Using the databases mentioned above will ensure you perform effective and efficient searches to identify data and information for your research. The primary goal of evaluating sources is to determine if they are acceptable to use for your purpose. Underlying acceptance is a decision about reliability, which may be influenced by a number of factors including the origination of the information, the level of the review, the adequacy of the citation, additional description and recommendation and/or use by authorities or peers. It is important in some fields, such as chemical safety, to distinguish where the information came from, the commercial, academic research, government, education or general public sectors. It may also be helpful to know how the information has been previously analyzed, particularly if it has been certified or correlated with other authoritative sources. ●Is the purpose of the source and specific study or information clearly described? ●Are the methods used in the study or to generate the information adequately described? ●Has the technique been repeated? independently? validated by models? ●Are the results consistent with other similar published studies? ●Is the source reviewed, by peers? by authoritative experts? ●Is the author identified? is the study clearly traceable by citation? ●Does the source include references to other relevant literature? With answers to these questions, you will have a good idea on the provenance of the data or information you are using, which will help you to determine how much you can trust it. Once you accumulated sufficient experiences in reading and evaluating sources, your judgment about a particular source may become more intuitive. However, keeping these questions in mind will help you to stay objective. The answers to these questions will also help you determine the additional information you want to include with your own writing when citing the sources so that the audience is aware of the context from which you draw your conclusions. Accomplishing this across millions of publications by hundreds of thousands of researchers in thousands of sources requires consistent practice. Standard formats specify the critical information components needed to identify a definitive information source. The standard style most commonly used in chemistry is published by the ACS9 and you will be asked to use this format for the assignment. Inclusive Pagination. DOI and/or URL (access date). Please consult the Reference chapter of the ACS Style Guide for the format of different types of citations9. This guide from Pennsylvania State University could also serve as a quick guide of styles (http://www.library.wisc.edu/chemistry/research-help/write-and-cite/acs-style-guide/) . Citation management tools are often used to help researchers organize citations, annotate references, and automatically format bibliography while they write. Starting to use a citation management software in early in your education will help you save your time when you work on class projects or writing an article, and organize an accumulation of interesting references for future use. The table below lists a few popular citation management software products.10 You may choose one or two to explore based on availability at your institution and your preference of functionalities. Reference records can be transferred among many of the tools below. If you cannot decide which one to use, start with any of the free ones and you can always transfer your references to another tool later. More detailed comparison and information about specific software can be found at the Research Guide page from the University of Michigan Library.10 You will have an opportunity to explore one or more of these tools in the next few weeks through another module: Collaborative Citation Management. EndNote desktop software. Collections can be accessed and shared online through EndNote Web. Can be run as a Firefox extension, or a standalone program. Apps available for most common browsers and MS Word. Collections can be accessed and shared online. accessed online. Collections can be shared online. Must be installed on the computer. Collections can be accessed and shared online. Communicating your research with peer students and researchers can take many forms. It can be a research article you write for publication but can also be an oral presentation or a poster you present at the end of your class or at a professional conference. You may also choose to communicate through social media if you have a good crowd of targeted audience there. Preparing a research poster is a good start point for you to explore your own style of communicating science. Who is my audience? How much do they know about my topic? What is the take-home message I want to deliver? What materials do I have or will I have for each section of my poster? How can I use visual ways to show my work? The answers to these questions will help you determine the content and design of your poster. 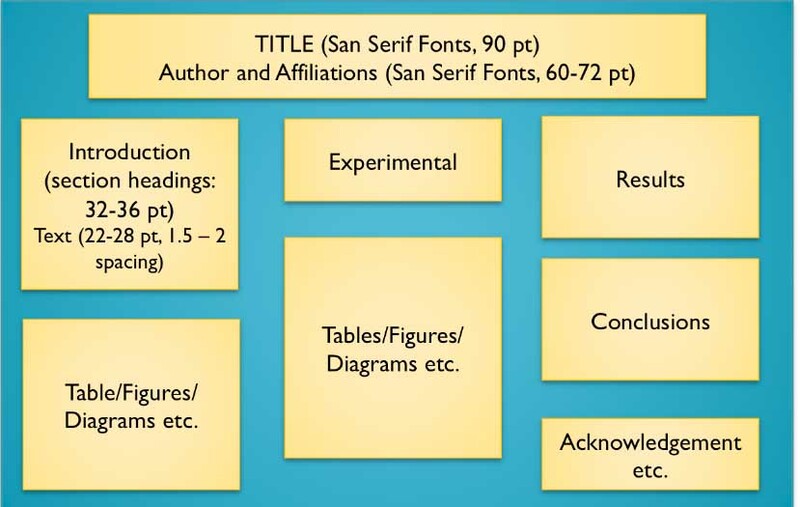 This figure below shows a popular way to design your research poster. Here are a few tips on preparing a good poster. Description: Create your own guide, based on your experience answering one of the research questions below (Note: You may also choose a research question you are currently working on). Use a flow-chart model for the guide, based on inquiry steps and post it in the OLCC course platform for others to benefit. 4.cite the source properly using the ACS style. 1.What is the melting point of the drug Lipitor? 2.Which solvent is greener, Benzyl Alcohol or Toluene? 3.Which common organic compounds are incompatible with Acetone and in what condition? 4.Trace the research pathway that lead to the ring-opening metathesis polymerization technique through reference and citation linking. You may use one or more secondary resources listed below based on the availability at your institution. Please consider how well these resources could provide data and/or information and if the data and/or information you identified there would be considered scholarly? ●Your answer to the research question based on data and/or information you find. ●See examples of video tutorials in the tutorials linked in the Database table under the section Accessing and Searching Chemical Information Databases. (1) XCITR: eXplore Chemical Information Teaching Resources. http://www.xcitr.org/ (accessed August 3, 2015). (2) McEwen, L., Introduction to the Chemical Literature. In Chemical Information for Chemists: A Primer, Currano, J. N.; Roth, D., Eds. The Royal Society of Chemistry: 2014; pp 1-27. (3) Wagner, A. B., Physical Properties and Spectra. In Chemical Information for Chemists: A Primer, Currano, J. N.; Roth, D., Eds. The Royal Society of Chemistry: 2014; pp 146-183. (5) Twiss-Brooks, A., Searching Using Text: Beyond Web Search Engines. In Chemical Information for Chemists: A Primer, Currano, J. N.; Roth, D., Eds. The Royal Society of Chemistry: 2014; pp 91-108. (6) Currano, J. N., Searching by Structure and Substructure. In Chemical Information for Chemists: A Primer, Currano, J. N.; Roth, D., Eds. The Royal Society of Chemistry: 2014; pp 109-145. (7) Currano, J. N., Reaction Searching. In Chemical Information for Chemists: A Primer, Currano, J. N.; Roth, D., Eds. The Royal Society of Chemistry: 2014; pp 224-254. (8) NIST Interactive Data Evaluation Assessment Tool. http://www.ceramics.nist.gov/IDELA/IDELA.htm (accessed August 3, 2015). (9) Janet, S. D.; Leah, S.; Paula, M. B., References. In The ACS Style Guide, American Chemical Society: 2006; pp 287-341. (10) Manage Citations with Zotero, Mendeley, RefWorks, EndNote and ProQuest Flow: Overview. http://guides.lib.umich.edu/citationmanagementoptions (accessed August 3, 2015). (11) Robinson, M. S., Write like a chemist: a guide and resource. Oxford University Press: Oxford ; New York, 2008.